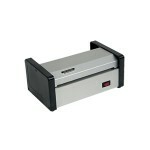 The CT1200 pouch laminator is designed for medium to heavy use (up to 100 pieces per day). The ID Lam has been discontinued by the manufacturer. The HD400 pouch laminating machine is designed for high-volume applications. Laminates card size pouches up to 4 inches wide. Pro-Lam Plus 330 - 12 1/2" Pouch Laminator is a heavy duty, efficient pouch laminator. 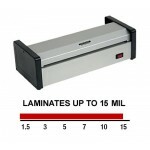 The Lamitek SL-14 is the ultimate pouch laminator for commercial use. Heated rollers provide scratch and bubble free output even on difficult to laminate digital color output. Akiles UltraLam 9 3/4" Pouch Laminator was designed with high quality components to render many years of trouble-free performance. 12" wide, high-quality pouch laminating, as well as mounting, up to 3/16" thick and 10 Mil Laminating Pouches. 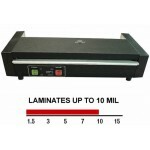 Full featured laminator at a budget price. Use laminate film up to 10 mils thick and documents up to 13 inches wide. High-end features include an adjustable temperature control and a quiet synchronous motor. The Pro-Lam Plus 160 Pouch Laminator is a professional grade, heavy duty, 6" thermal pouch laminator. Excellent for ID Card Laminating for school or office.